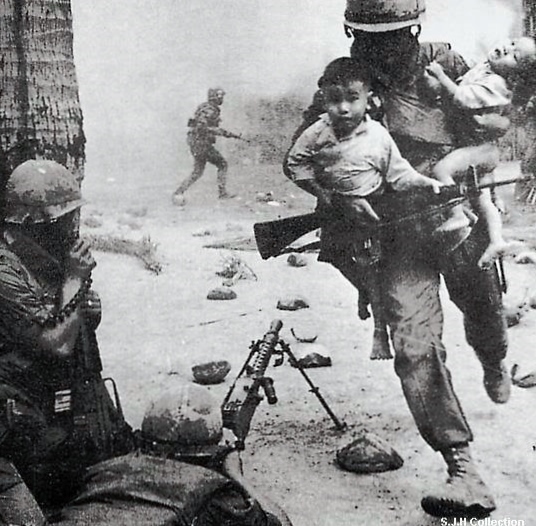 »General Military History»The Story Behind the Marine Rescuing Two Babies. The Story Behind the Marine Rescuing Two Babies. The below picture turned up on my FB feed the other day. I was so intrigued I tried to track down the original via a number of Google searches. I got one viable hit and traced it back to an article by Gordon Duff writing in Veterans Today. Duff’s lengthy article is titled, Vietnam, Decades of Liars Blacken the Names of Real Heroes. The article dates back to 2010 and it documents Duff’s experiences as a Marine grunt in Vietnam. Duff attributes the picture to the battle for the Vietnamese City of Hue (pronounced Way), a city taken over by the NVA and VC during the Tet Offensive of 1968. Three under strength battalions of Marines as well as Army troops were ordered to take it back. Part of the story for the Battle for Hue is told in the fourteen minute video below. The above picture is an indication of the vicious street fighting that took place in Hue. As a provincial capital the NVA and VC embarrassed both the South Vietnamese Army and ours when they took it during Tet. When counter attacked they were not about to give up the city without a bitter fight. As noted in the video civilians were often caught up in the crossfire. This is also illustrated by the Marine rescuing two babies. The photograph is striking. In the background one Marine advances across a city street. In the foreground another Marine is coming back the other way with two babies tucked under his arms. The Marine’s face is shaded by his helmet. Perhaps his name is hidden for all time because we cannot see his face. It may just as well because from what I read Marines do not consider themselves heroes-a term that is tossed about way too loosely in our culture. In between the images of one Marine crossing the street and another returning the other way we see two more Marines. One Marine appears to be spotting for the Marine giving covering fire from a M-60 machine gun. In my opinion, there are four heroes in the picture and two babies who perhaps survived that terrible war due to their efforts. The photo may be iconic but it certainly is ironic as well. When our servicemen returned from the Vietnam War they were not greeted with parades. Instead, they were often greeted with swear words and had epithets such as “baby killers” hurled at them. And yes, I know full well that were atrocities committed by our troops so spare me the history lesson. What galls me is the one-sided image makers that would focus only on our faults and not promote the heroism of these four Marines saving babies. What further galls me is that the same people who would call these four men baby-killers are the same who now run our country (think John Kerry, Sec. of Defense here). To the four unknown Marines in the picture I thank you for your service to our country and for saving the lives of two babies caught in the horror of a vicious street fight. Hello- Quite a compelling photo. However, the machine gunner in the foreground is armed with a somewhat antiquated m1919 Browning machine gun. 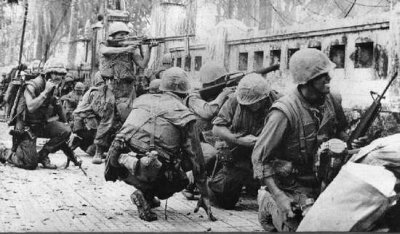 These weapons were being used mostly be ARVN forces at this time, so it is likely that some ( if not all) of the Soldiers in this photo are South Vietnamese. Great observation Nick. I missed that entirely. If US Marines it would be a M60. I’ll see if I can track down the original source. Thanks for stopping by and the comment.